Following on from their W.G.Grace Ate My Pedalo, Tyers and Beach have combined again in this further amusing book which concentrates on imaginary Ashes diaries from W.G.Grace through Douglas Jardine to Andrew Strauss. Not only cricketers, though, are mentioned: Stuart Broad's sister, Gemma, and Sky Sports presenter, Charles Colvile, also have their "thoughts" aired in this spoof and irreverent book. All are written humorously and in the style of the day to which the "diarists" appear and well-known incidents which have made the headlines and gone down in cricketing lore are certainly not missed: David Gower's Tiger Moth episode, Douglas Jardine's feeling towards everything Australian and Mike Gatting's dismissal to Shane Warne's first ball in a Test in England. Alan Tyers cleverly uses words which are used by different cricketing nations: "the rooms" for Australians where the English may use " changing rooms" and he also picks up on the foibles for which many of the "diarists" are known for such as Mike Gatting's love of Branston pickle and Kevin Pietersen's confident assessment of himself. 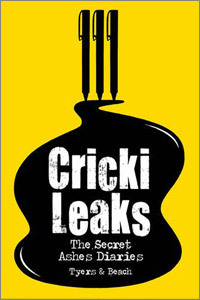 As always, Tyers's words are expertly complemented by Beach's excellent sketches and I am sure that anyone who enjoyed W.G.Grace Ate my Pedalo will thoroughly enjoy CrickiLeaks.